Walking up Mount Philo in Charlotte is a trip into the past. If you go with historian Judy Chaves, you can look back 50 or a hundred years — or 500 million. The mountain is only 968 feet high, which in many parts of the country would qualify as little more than a hill. But it offers a spectacular view of the Champlain Valley. And, as Chaves has discovered, Mount Philo is richly layered with history — human, botanical and geological. At 64, Chaves is slim, energetic and animated. Despite her pure-white hair, she doesn't look like either a grandmother or a scholarly researcher. But she's both. And she's been climbing mountains since she was a girl. "I'm happiest on the summit of a mountain," Chaves declared. Mount Philo has given her plenty of opportunity to enjoy that pleasure. A freelance writer by profession, she lives nearby and has hiked up the mountain several times a week for more than 20 years. At first her hikes were just for enjoyment and a way of keeping fit. But about 10 years ago, the mountain began to speak to her, Chaves said, and her exercise turned into research. It probably began when she noticed that an iron railing at the mountain's highest lookout had been replaced with a plastic-coated chain-link fence. After an insistent campaign by Chaves, state parks officials replaced the jarring modern fence with a reproduction of the historical one. It turned out that the old railing, which had been installed in about 1902, was one of the reasons Mount Philo had won inclusion in the National Register of Historic Places. Chaves was hooked. 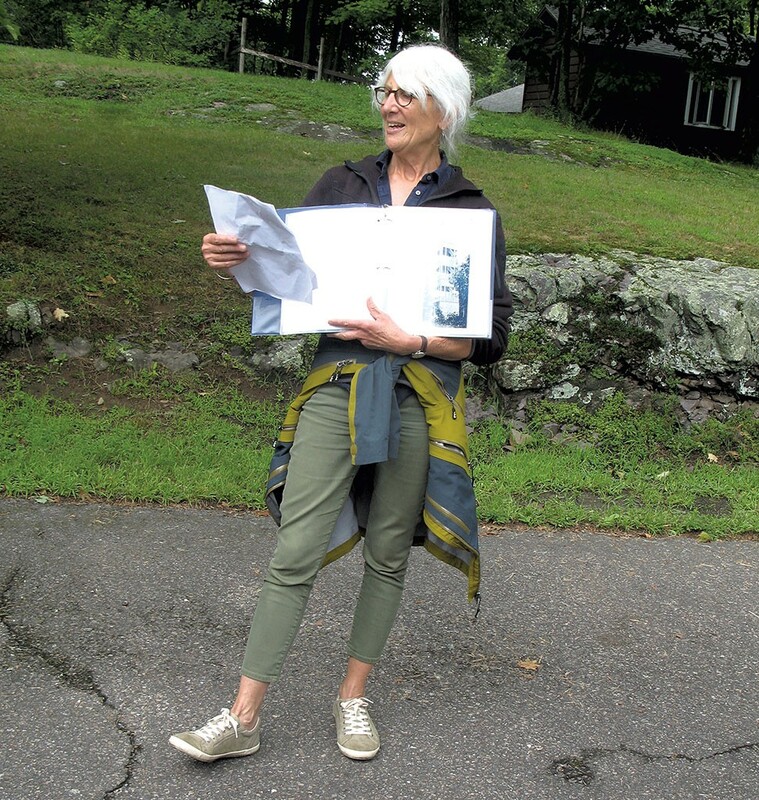 Her hikes became historical sleuthing missions, supplemented by trips to the Vermont Historical Society, the University of Vermont's Special Collections Library, the Vermont State Archives & Records Administration, local libraries, and other sources. Mount Philo's past, she found, is deep and complicated enough to offer a vest-pocket history of Vermont. It's all there, from prehistory and the arrival of European settlers, through the growth of farming and the 19th-century merino sheep craze, to the birth of tourism and 20th-century environmental concerns. "When you learn about the history of Mount Philo," Chaves said, "you're learning about the landscape history of all of Vermont — all of New England, actually." Old photos and maps, land records and magazine articles — even faded postcards — gave her clues and helped her pinpoint historic places on the mountain. Three years ago, Chaves began writing a book based on her findings. Secrets of Mount Philo: A Guide to the History of Vermont's First State Park, recently published by the Vermont Historical Society, is a fascinating trip through the mountain's intricate past and a guide to its relics, hidden byways and natural communities. Chaves dedicated the book to her grandson, Asa, "and his generation, the future stewards of our public lands." Mount Philo emerged millions of years ago in the mists of geologic time. Scientists call it a klippe, a relic of the Champlain Valley thrust fault. Such a fault appears when one immense plate of the Earth's crust is forced up over another. The formation of the Champlain Valley thrust fault, which occurred roughly 500 million years ago, is one of the mega-events that shaped the Champlain Valley. Philo, like Snake Mountain off to the southwest and other rocky eminences rising above the valley, is an eroded remnant of the leading edge of that thrust. Ever since humans came along, hundreds of millions of years later, Philo's summit has provided visitors with an unparalleled vista of the Champlain Valley, Lake Champlain and the Adirondack Mountains across the lake in New York. There's no evidence that Native Americans lived on the mountain, but they may have used it as a strategic lookout. Nobody knows for sure how Mount Philo got its name. The most likely explanation, Chaves believes, can be found in Esther Munroe Swift's classic book Vermont Place Names: Footprints of History, which says it was probably named during one of New England's "bursts of enthusiasm for names with a classical flavor." Philo means "love" in Greek. As European settlers moved into Vermont, farms began to surround Mount Philo. And as the nation's demand for wool grew, nearby sheep farming burgeoned. By the middle of the 19th century, the mountain was completely denuded of its primeval forest cover. That was the story throughout Vermont. In the 1840s, Chaves' book and other historical references point out, nearly 1.7 million sheep inhabited the state, and farmers had cleared three-fourths of its trees. But after the Civil War, the demand for wool declined, the Midwest opened — with its flat, fertile, more temperate lands that could produce meat and wool more efficiently — and sheep farming moved west. Dairy cows took the place of sheep and soon dominated Vermont agriculture. Since cows don't climb mountains, the lower slopes of Mount Philo remained pasture, but forests returned to its rocky upper half. Then, as now, making money from a farm was difficult, and many Vermont farmers began taking in city tourists to supplement their income. It was, in effect, an early form of agritourism. 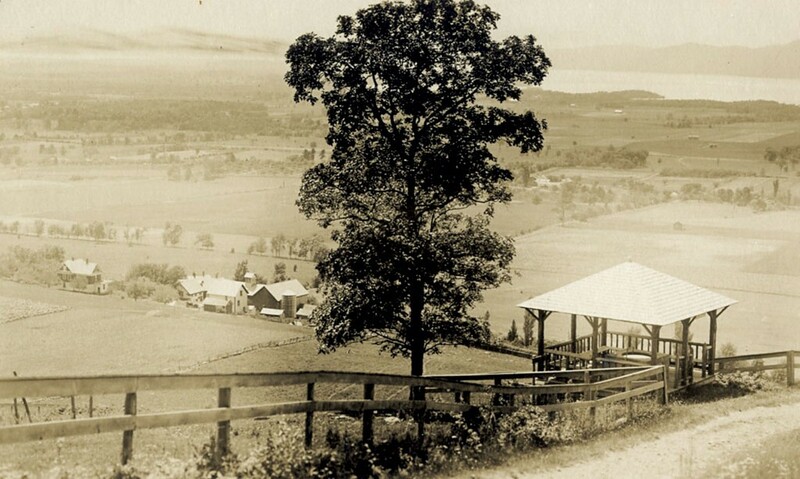 In 1886, Frank and Clara Lewis bought a farm about a quarter mile south of Mount Philo and started welcoming tourists from New York City and Boston. Their business prospered, and they replaced the original farmhouse with a larger, more comfortable building they named Mount Philo Inn. At that point, fate stepped in. A wealthy Massachusetts couple, James and Frances Humphreys, came to stay at the inn, fell in love with the place and began summering there. They regularly trekked up the adjacent mountain. As Chaves points out in her book, similar construction was going on all over the region. Carriage roads wound their way up Snake Mountain, Camel's Hump, Mount Mansfield, Mount Equinox and the White Mountains of New Hampshire. If you had a mountain — even a small one — you wanted a carriage road on it so your guests could navigate it in style. 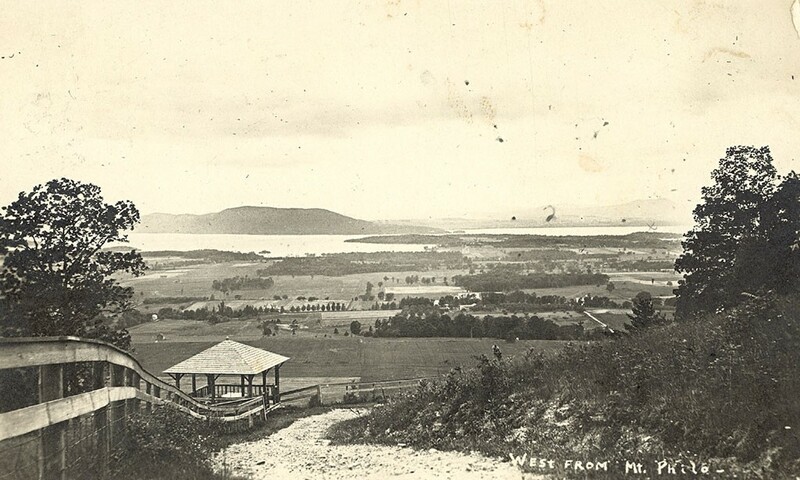 By 1902, Mount Philo was a fully equipped tourist attraction, and Lewis promoted it in exuberant prose. A pamphlet declared: "The mountain road, threading its way through open fields and woods, affords a variety and intensity of scenic beauty seldom equaled in New England." James and Frances Humphreys were his most enthusiastic guests. The couple bought land for a summer home near the mountain and eventually came to own the peak itself. Even after James died, in 1914, Frances continued to come to Vermont and was deeply devoted to Mount Philo. She wrote touching, sentimental verse about it. When someone asked Frances whether she would have the mountain timbered, she insisted she would not cut a single stick. "There is something in the world besides money," she said. What really mattered, in her view, was that the mountain remain unspoiled and available for Vermonters and others to enjoy. In 1924, Frances generously gave the mountain outright to the State of Vermont. Thus it became Vermont's first state park, and it remains one of the most popular. Just to the south, the original building once run by the Lewises operates today as a boutique hotel. When Chaves began her research, there was no comprehensive chronology of Mount Philo's long history. She had to tease it out, hiking the mountain almost daily. An unusual stand of trees, an ancient road track, an abandoned quarry, odd rock features and crumbling stonework all became tantalizing clues that Chaves checked against old photos and historical documents. "The most fun and exciting research was done on the mountain itself," she said. Tracing the actual route of the old carriage road was a start. The Civilian Conservation Corps had remade the earlier road and added a down-road that was safer for automobiles. The CCC also augmented the reforestation of Mount Philo by planting stands of trees. The new growth made Chaves' research much more difficult; many of the views that open pasture provided in 1902 are now masked by forest. One of her puzzles was a crumbling concrete block about four feet square with a circular depression in its top. It lies tumbled and broken by the side of the mountain road, about halfway to the summit. The spot offers no view, because it, like most of the road, is now surrounded by woods. In an old photo postcard of one of the historic gazebos, Chaves noticed a circular basin and what looked like a length of pipe. More research enabled her to say with certainty that the concrete block had been a basin in Well Spring Shelter, a popular gazebo about halfway up the carriage road where horses and hikers could get a cool drink of water. That crumbling basin is now the sole remnant of the gazebos that Frank Lewis built on the mountain in 1901. The most notable group of trees nearby is a stand of Norway spruce — a non-native tree that the CCC planted in 1935. Such bits and shreds of the mountain's layers of history are "portals to the past," Chaves said. For her, Mount Philo's history is not dead, or even static, but a continuing expression of the spirit of the mountain. That she enjoys her frequent hikes is obvious, and Secrets of Mount Philo is imbued with her affection for the place. "There's something about this mountain that inspires love," Chaves declared. Secrets of Mount Philo: A Guide to the History of Vermont's First State Park by Judy Chaves, Vermont Historical Society, 113 pages. $19.95 paperback. The original print version of this article was headlined "Peak Experience"